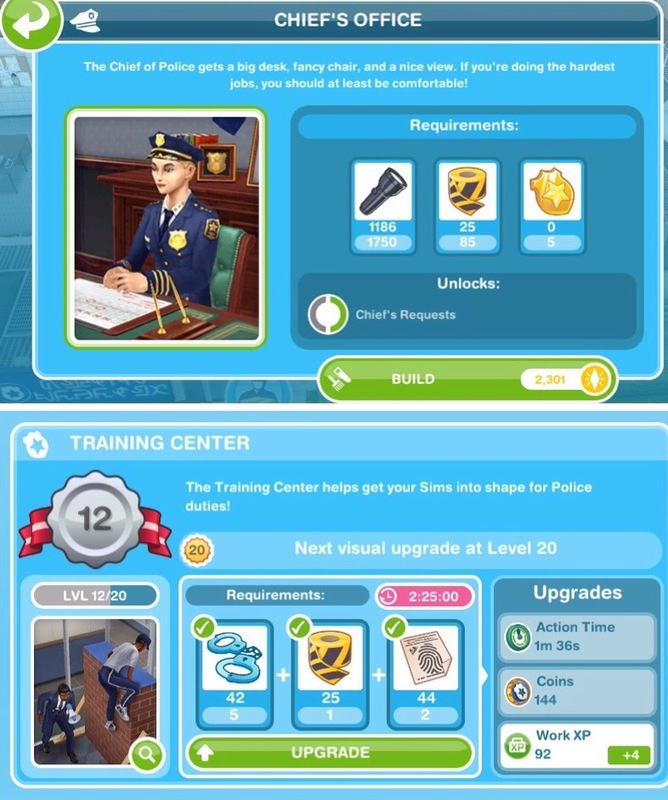 Each time your sims complete a task (that section will turn from grey to green) a police coin bubble will appear above their head, click this and they will earn police coins and XPs, the experience points are towards levelling up, so they will level up quicker than if you just sent them to work. If they are working offsite they will just work for 8 hours and they won’t earn any resources as they won’t be helping any sims. Then only 2 sims, once they reach level 6 can choose to be either Metro Police or Special Agent, only one sim can be metro police and one sim can be special agent, all other sims will stay as level 6 sergeant. Once you unlock the workstation you have to use the resources to build it before you can help sims using these workstations, only the metro police will be able to complete tasks to help sims that require one of the workstations above. I will be going into detail about workstations later in this post. Once you unlock the workstation you have to use the resources to build it before you can help sims using these workstations, only the special agent will be able to complete tasks to help sims that require one of the workstations above. I will be going into detail about workstations later in this post. If you don’t have the amount of resources you need it will say it costs LPs, when you have the right amount of resources you can build/ upgrade the workstation without LPs (you know you have all the resources you need when there are ticks next to all the resources): When you upgrade each workstation to level 10 and 20 there will be a visual upgrade to the workstation, those pictures are shown below each of the tables. Do I need to be VIP to use the police station? I’ve decided it’s better to upgrade the prebuilt stations before taking on the others. That way actions are faster and items get collected faster. 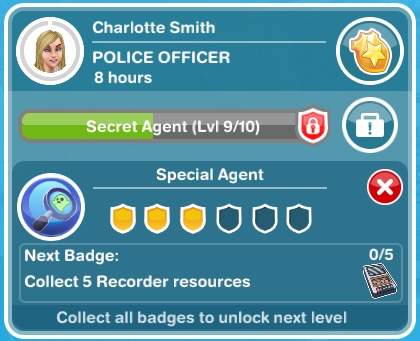 Im not sure about the “only one sim can upgrade per badge.” Both police required the same items to be promoted and after I earned enough for one, they both were promoted. I didn’t say only one sim can upgrade per badge did I? Where did I say that? I said ‘Only one badge can be collected per shift’ as in each sim can only earn one badge a shift, I will change the wording to make that clearer. Question how do you get red of the bubbles if you do not complete the tasks? If you don’t complete the tasks they will leave in about a week, you cannot get them to leave before then. I have to help 2 important sims but it’s been over 2 weeks and I’m not seeing any important sims at the police station, just normal bubbles with doughnuts etc. Is this normal? Yes, sometimes they can take a while to appear! Just keep going to work with your sims and hopefully they will appear soon! Thank you so much for your awesome guides, they always help me when I have odd questions! Well I now have an odd question that I can’t find the answer to. I am trying to build the chief’s office and am trying to figure out if the only way to collect golden shields is to trade resources? I’ve been playing for days and not one person I’ve helped has had a golden shield as the reward. You’re welcome! I have not seen anyone with a golden shield resources either, I asked someone at EA and they said they do appear but they are a rare resource so I would recommend you trade your resources for them as you could be waiting a very long time for someone to show up! Thanks so much for this awesome blog. I’m finally taking the time to do the professions and almost have all stations at all three professions built. I’m wondering, however, what happens once all stations have been upgraded? What then are the sims going to work for? Just Simoleans? Thanks so much for your help! They will just go to work to earn simoleons yes. You’re welcome and good luck with the professions! They also will be stockpiling resources for SimTown Market events! Unfortunately you cannot encourage them to appear. The only thing I can think of is if you send two unspecialised sims to work there first until all the tasks are the short ones and then cancel the shift for one of them and then send your sim with this badge requirement there so the only long tasks you will get are the ones that sim can complete then the other sim who is unspecialised can work on all the short ones, hopefully this will allow you to help more sims in a shift to find these donuts. Sorry I couldn’t be more help! Can you only send a sim to work at the police station if you are a VIP? 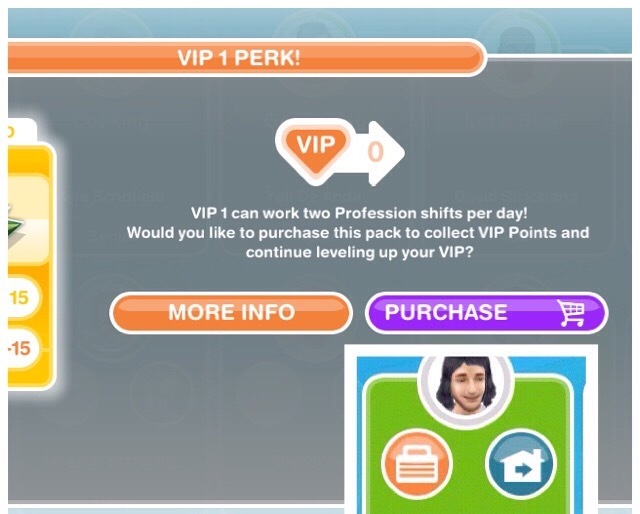 No you do not need to be VIP to send your sims to work but you do need to be VIP to send them twice in one day, if the suitcase is orange just wait for the next day to be able to send them again. I have a question that may be hard to understand, but I’ll do my best in my explaination. So I just finished a shift with two sims that are specialized (Special Agent and Metro Police). I started another shift with a sim that is brand new to the work place (Cadet). However, the “customers” that need help are still at the police station from the last shift; meaning that all their needs require a specialist. How do I basically “clear” them so that new customers can appear so that my Cadet can actually help them? Unfortunately you can’t clear them you have to wait for them to leave and that can take a few days, the best thing to do just before your higher level sims finish is make sure they have done all the tasks that lower level ones can’t do and leave the ones they can do,for example if you have to help a sim using the front desk and jail cells make sure you complete the jail cells one but leave the front desk one for your cadet so when they have finished with that sim a new sim will come in with tasks they can complete. Do you have any tips or tricks for completing a shift on the higher levels? I have one Sim in each police specialization and both are on level 8. I am having a hard time completing 25 customers per 8 hour shift. So many 57 minute tasks! I can barely finish 10 customers before the shift is over. I’ve tried working my two Level 8s together and also pairing each one up with a lower level officer for a shift. Nothing really works so far. Any suggestions that don’t involve burning through LPs to finish tasks early? Thanks, I’ll try that! I’m also working on station upgrades to reduce the completion time on the longest tasks. It is taking forever since I’m distracted by all the other game events this month, but I’ll get there eventually. Is there any way to build skill level with this profession outside of work? Like practicing on a fire hydrant if employed at the fire station, or practicing making film if employed at the movie studio. Unfortunately there are no items for the police career. I had a sims a while ago that was at level 7 metro police and they started to help an important sim but didn’t finish, before they became a senior and eventually died. One of the tasks remaining is the level 7 clean jail cell task. As i am tying to level up a newer sims it is asking me to help 2 important sims but as it is a level 7 task it is not allowing me to complete it and u can only have one important sims at a work ace at once. Therefore i am unable to complete this task. YOUR BLOG IS GLORIOUS. Now, apologies but I can’t find the answer to this question, so I shall pose it: both of my specialized police Sims have reached the 100% bar in their careers, but my two unspecialized police workers arent progressing. I know they can’t move beyond level 6, but it’s like the glow in their bars won’t move. My two unspecialized film workers were able to reach 10/10…so I’m just curious why the police are not able to move forward. The film workers could practice filming at home, which helped move them along, but nada for the cops. Is it more likely if I send them to work “offsite” as I can’t always get devote enough time to have them help 25/25. Any insight? Okay, so I am currently trying to get the Forensics lab built. It requires 1250 walkie talkies, 320 fingerprints, and 225 handcuffs. I currently have 1339 walkie talkies, 158 handcuffs, and 271 fingerprints. 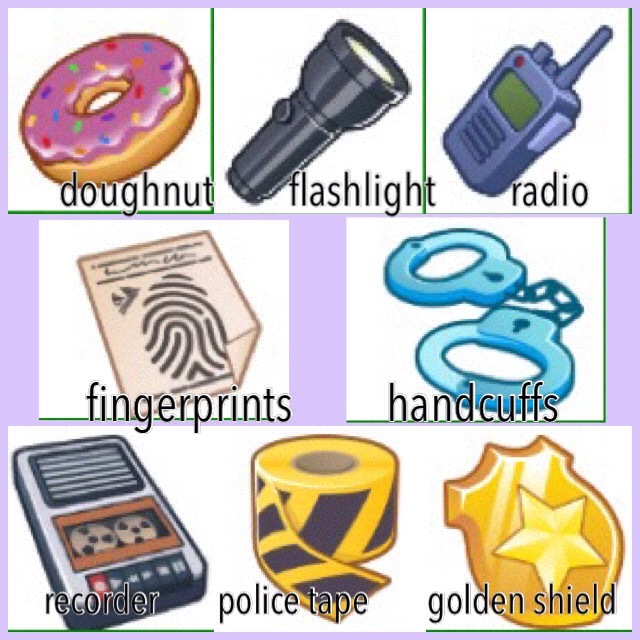 I get walkie talkies and flashlights by the buckets, but can only get pinches of fingerprints and handcuffs. So my question is why does this happen? I’ve been trying to get the Forensics lab built for months. Hi! So i had one level 7 sim that turned into a senior. As a result, I don’t have one of the workplaces anymore until I reach level 7 with another sim to unlock it. Will I have to buy the workplace again? You won’t be able to use it again until a new sim reaches level 7 but you won’t have to buy it again when they get there. You are awesome! I know what it takes to make a game blog, and WOW, the work you put into this! Just started Freeplay and found you, been snooping around the blog. Wanted to see how much it was to build the work rooms – ouch – but thank you. This will be my go-to blog for Freeplay. Hey, I love your bog, but when I send my sim to work at the police station with me helping him the bubbles that are meant to appare over his head are just not there. This annoys me because I need to complete the professions training quest and to complete a bubble is one of the tasks so I can’t continue with the quest and the quest has to be completed before I can get my other sims to new jobs. I am worried it a glitch or I’m not pressing the right thing. What are you thoughts on how to fix this? Hi! Im working at the police station and a message pops up that says my sim needs to be near or at a bbq in order to complete the task. I tap on the bbq near the playground but nothing happens. This is the first time this bbq message has ever popped up. thanks for all your great info! I keep trying to get my police officer to complete an action but it keeps popping up an error message “To complete this action, your Sim needs to be able to get to and use a BBQ.” I have literally done this action a hundred times and now all of the sudden it won’t let the Sim do the action. Any idea how to fix this issue? Hi, for some reason my metro police sim won’t complete the squad car action. It comes up with an alert saying that he can’t reach the barbecue. Love your blog, lots of great info. I haven’t seen this anywhere and I’m wondering if I’m just missing something. I just unlocked the Squad Car, and the tasks show green when my level 7 Metro Police Sim clicks on a customer, but when he selects the task, I get a pop up that says “Action Failed. To complete this action your Sim needs to be able to get to, and use, a BBQ.” What does that mean? I can see a BBQ in the little park area, and he can get over there. Do I need to upgrade the squad car or something? Just my luck it happened right as I unlocked it! Thanks for passing on the message. I cannot complete police tasks because it says they must have access and use of a barbeque. I am stuck. I just downloaded a Sims Freeplay update for my game today, and I’ve already noticed a problem going on at my SimTown’s police station. I’ve got 3 Sims that work there, a detective, a police officer, and a trainee. The police officer is the one I’m having a problem with. Whenever I have him go do the “Team Building” request, he refuses to do it, and a pop-up will say that “To complete this action, your Sim needs to be able to get to and use a BBQ”! Nothing is blocking the way to the BBQ, and I actually had him walk over there just to get him to realize that. Yet he continues to pull off the “no way/uh-uh” gesture and the pop-up will appear again. He can do the other tasks without a problem. It’s this one that’s a problem. I’ve had to cancel his shift, wait a few hours, then send him back, but this problem still persists. Closing out of the game also does nothing. I’ve been tempted to just have him quit and make the trainee the new police officer, yet I’m afraid that I’ll have the same problem with him. You’ve told the others before that you’re going to contact someone and get them to fix the problem, but until then, do you have any ideas as to what I should do about this? I see a lot of people are having trouble with the squad car BBQ glitch. I am also having this problem. Is there any word from EA about when we might expect a fix? Have they said anything about why it’s happening? Yes, it was working the day after I posted this comment. Thanks for your help! Hi, so a new event has started and now I am unable to complete the jail cell action. It doesn’t come up with an error message, it just stops halfway through. Has this been an issue for anyone else? There is a glitch with the police profession where I can’t “Clean Cells” or “Uphold the Law”. I’ll send the Sim to do the task and then I come back, supposedly being finished, and the game will say that the sim can’t access it. Any idea what’s going on? A lot of players are having this issue, they are working on a fix which hopefully will be live soon. No you don’t, you have to be VIP level 7 you can upgrade more than one workstation at a time, if not you need to wait for the squad car to be upgraded and then you can start on the jail cell.